It’s been a brutal winter for Minnesota on the ice too. Following a strong couple of months, the Wild have gone 13-14-3 since the start of December. To add salt to the wound, they’re seemingly caught in a stream of bad luck. Top offensive defenseman Matt Dumba (22 points in 32 games) suffered a torn right pectoral muscle on Dec. 15 and may not return this season. The team sorely misses his mobility, dynamism and wicked point shot. Prior to his injury, Minnesota was averaging 3.16 goals per game. Since then, that mark has plummeted to 2.35. That’s not entirely down to Dumba’s absence of course, but the 24-year-old has quietly improved in each of his five pro seasons and become a vital component of an attack that often lacks finish. Earlier this week, Mikko Koivu (29 points in 48 games) tore his ACL and meniscus in a collision with Buffalo Sabres forward Tage Thompson. He’s out for the year. Moreover, his outlook for 2019-20 isn’t exactly rosy. This type of setback can derail a player in his physical prime, so Minnesota’s 35-year-old captain may not recover well enough to perform at an NHL level next season. This loss particularly stings because Koivu acted as the club’s defensive conscience up front. He still eats hard minutes and delivers solid grunt work in all three zones, resulting in a terrific 1.96 GA60. That ranks second among Wild forwards and 40th among all NHL forwards (minimum 500 even-strength minutes played). With key injuries piling up and the Wild trending downward, they’re unlikely to cling to their playoff spot for much longer. Even at full health, this team wasn’t doing real damage in the postseason. While it controls 51.1% of the shot attempts (10th) and 53.9% of the scoring chances (4th) at 5-on-5, it simply doesn’t boast the offensive firepower (25th) or defensive rigidity (11th) to keep pace with the top dogs. That much is reflected in the club’s 49.1 GF% (19th). Devan Dubnyk (2.58 GAA, 91.2 SV%) is a good netminder, but he’s not a one-man show who can steal a series or two by himself. This is a familiar story. In their 17 years as the Wild, they’ve advanced past the first round three times and missed the postseason altogether on eight occasions. In essence, they’ve come to embody the slightly more successful side of mediocrity. At the end of day, however, any shade of mediocre remains mediocre. The franchise should strive to reach a higher level long-term, and that usually requires a teardown and rebuild from the ground up. It’s time for management to acknowledge the club’s current situation and exercise some foresight by parting with big pieces in favor of draft picks and top-tier prospects. That’s how you compete in the modern NHL. Trading Nino Niederreiter for Victor Rask (2 points in 8 games with the Wild) just doesn’t move the needle. As additional incentive for Minnesota to start working the phones, bottom-six center Brian Boyle just returned a second-round pick to New Jersey. Sell while the getting is good. Since 2015 first-rounder Joel Eriksson Ek (9 points in 38 games) and 2016 first-rounder Luke Kunin (10 points in 24 games) haven’t emerged as difference-makers so far, the Wild desperately need impactful young forwards. Whether they’ll draft wisely is another matter entirely. For now, the key is acquiring those picks. 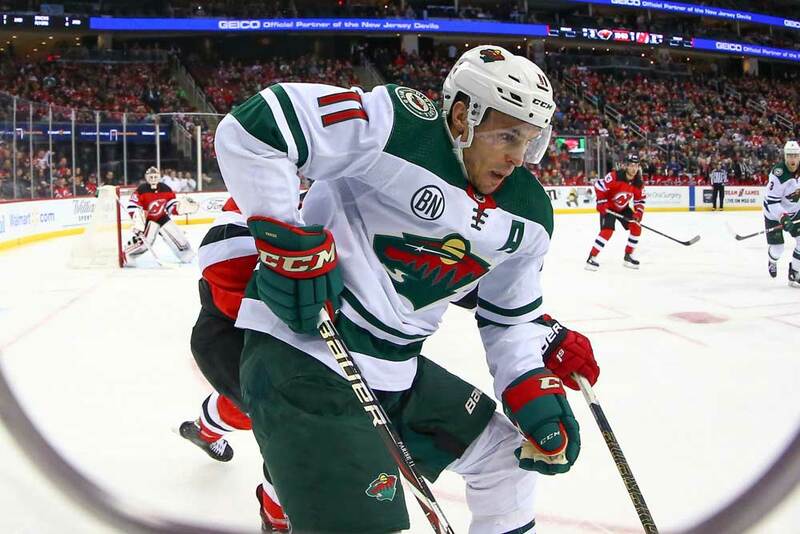 Minnesota would likely prefer to keep Dumba and Mikael Granlund (44 points in 55 games) on the roster. Both sit in the right age range to grow with and perhaps mentor prospects while providing great value on the ice. Everyone else should be considered available. Even at age 34, Eric Staal should appeal to contenders as a rental. He revived his career with the Wild in 2016-17 and is enjoying another solid campaign (37 points in 54 games, 56.4 SCF%, 59.1 GF%). The 6’4”, 207-pounder still leverages his frame well to protect the puck and gain inside positioning in the slot. Given that his contract expires at the end of the year and his modest $3.5 million cap hit would be prorated, he’s a low-risk option for teams in need of an offensive boost. 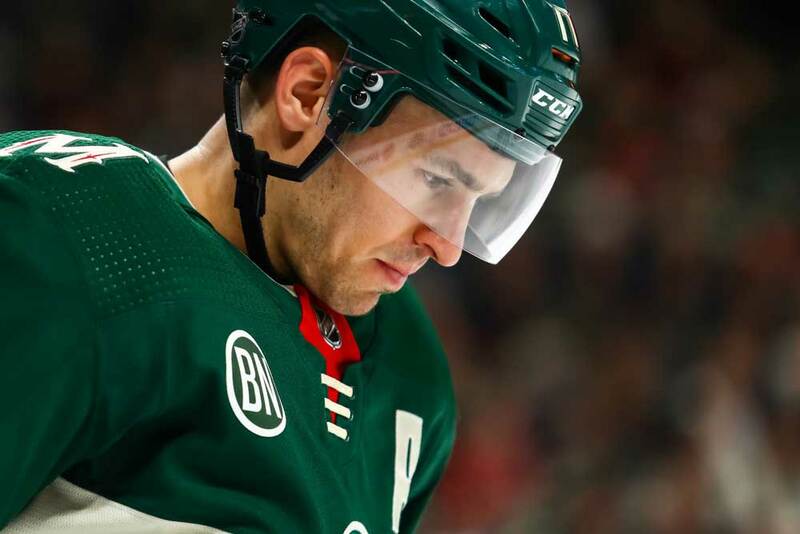 Though fellow 34-year-old Zach Parise has bounced back in a serious way this season (47 points in 54 games, 54.5 SCF%, 52.0 GF%), Minnesota may struggle to find any takers because he carries a $7.5 million cap hit through 2024-25. He would be 40 by then. As such, the Wild would surely need to retain a significant chunk of his salary — and that’s not palatable unless the return is incredible. Who’s offering a package that’s too good to pass up for 34-year-old Parise? Nobody. The best remaining pieces up front are Jason Zucker (28 points in 54 games) and Charlie Coyle (28 points in 55 games). The former isn’t a play-driving winger, but he offers blazing speed that would slot in nicely on a second or third line. Meanwhile, the latter is a big-body presence (6’3”, 220 lbs) with a sound two-way game. Both have movable contracts and would bring back solid futures. On the blue line, Ryan Suter’s (37 points in 55 games) contract should prove as difficult to trade as Parise’s because they’re virtually identical. That leaves Jared Spurgeon (32 points in 55 games) and Jonas Brodin (13 points in 55 games) as intriguing options. As one of the true underdog stories in hockey, 2008 New York Islanders sixth-round pick Spurgeon has been wonderful for the Wild since his breakout campaign in 2013-14. The 29-year-old thrives on his smarts, skating and puck management, as he leads Minnesota’s back end with a 52.6 CF%, 57.8 SCF% and 54.1 GF%. Plugging this veteran into your top four would represent a huge coup. Teams may also feel compelled to gamble on Brodin. The 10th overall selection in 2011 is a quiet, steady rearguard who uses his positioning and stick work to keep opponents at bay. Some may view his 45.1 GF% as a red flag, but he’s had poor puck luck this season (career-low OISV%) and would represent a nice addition to round out the back end. Neither has an awful deal that would deter any buyers. That’s a lot to work with. Frankly, it’s a whole lot more than most rebuilding clubs have because Minnesota hasn’t announced itself as one yet. However, those trade chips won’t amount to much unless management comes to terms with the team’s outlook. It shouldn’t be expected to ship out all of these assets, but trading a few of them would allow the Wild to set their new project in motion without needing to hit rock bottom first. A head start is always nice. If they want any chance at winning in the next decade, they need to cut their losses now. Otherwise, they’ll merely continue to tread water.